Sporting history will be made this month when for the first time, on 11 April 2015, women will row in the Oxford-Cambridge Boat Race on the same terms, and on the same waters, as men. Although held intermittently since 1927, until recently the women’s race has been seen as the rather feeble younger sister of the famous men’s race. However this year the two women’s teams will follow the same tough 4.2 mile (6.8km) course on the Tideway- the powerfully tidal stretch of the Thames in London - from Putney to Mortlake, rather than the separate 1.25 mile (2km) stretch of the calm waters of Henley to which they have previously been relegated. What has made this possible is not, of course, a sudden increase in female interest, fitness, strength or ability. Despite romantic images of ladies lolling their fingers in rivers as they are rowed upstream by strapping young men, women have in fact always enjoyed an active role on the water. The subject of my first biography, Eglantyne Jebb, the future founder of the charity Save the Children, was passionate about rowing on the Isis when she was a student at Oxford's Lady Margaret Hall in the 1890s, and she was a woman who regularly played hockey and fencing, and rode horses and bicycles - on one occasion with such vigour that she was cautioned by the police. 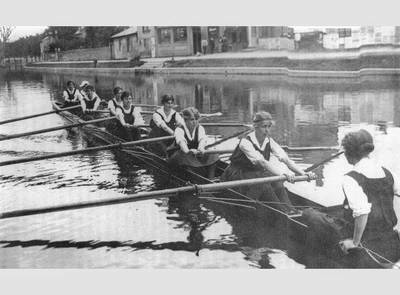 Eglantyne was too early to participate in competitive rowing, as female Oxbridge rowing crews only started to compete against each other in 1927, provoking endless abuse from male and female spectators along with claims that the race was unfeminine and bad for female health. The first race between the Oxford University Boat Club and Newnham College, Cambridge, was held on the Isis. Since the two crews were not permitted on the river at the same time, they had to be judged separately on 'time and style’. Inevitably objections were still raised and, according to The Times, ‘large and hostile crowds gathered on the towpath’. It was only in 1935 that the race became a direct contest over a half mile (1000 yard) stretch of the Isis, the Camb or, just once, on the Tideway at Barnes. 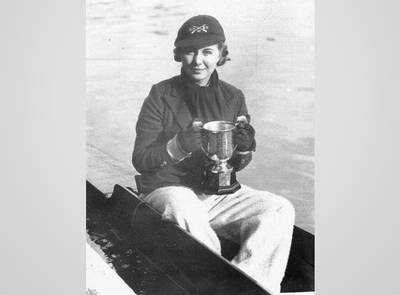 Betty Francombe, who had progressed from stoker to coach of the Oxford women's team, donated the cup, which is still being presented. In the mid-1950s however, drama struck when the Oxford crew went over a weir during training the day before the race and, as a result, were banned from the river. Funding evaporated overnight, the women's boat clubs almost sank from sight, and no more women's races would be held for almost ten years. 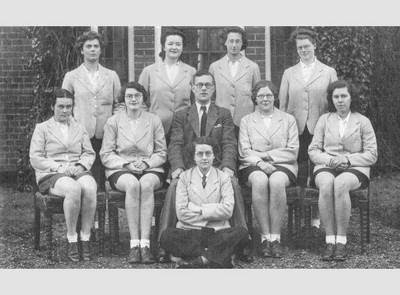 It was two Oxford engineering students who revived the women's races, still in the face of open hostility, in the early 1960s. At first the crews had to fight even to take part in the inter-college ‘bumps’ races but, supported by a college Canon who enthusiastically coached the team he called the ‘Perspiring Persephones’ or ‘Swetty Bettys’, they had an impressive run of success. Despite being branded, ‘a ghastly sight’, and even ‘an anatomical impossibility’, the race now became an annual fixture, moving to the Thames at Henley in the 1970s. Rowing has recently been gaining enormous popularity as a sport among women, and British rowers are world class. At the 2012 Olympics, Britain topped the medal table for female rowing with four golds, and an impressive nine medals overall. Nevertheless the press still managed to send mixed messages. 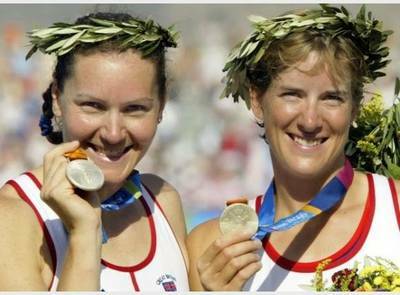 Britain's most successful rower, Katherine Grainger, who claimed gold after three consecutive silvers, was reported as having finally shaken off the nickname, ‘the bridesmaid of rowing’, and more coverage focused on her dreams of being introduced to David Beckham now that she had won gold. At the time she had been a world champion since 2000, and held a law degree, a master’s in medical law, and was working on a doctorate on the science of homicide which she has now achieved. While British women were leading the world at the Olympics, there was still little support for the sport at home however. The women’s Oxford and Cambridge teams have faced persistent lack of media interest, funding, and access to professional facilities. Until recently, the female crew even had to pay their own train fares to the rowing lake, while the men were driven in branded mini-buses. Now however, the women have won the support and sponsorship of a London based company. Shocked to discover that they had not had any commercial sponsorship previously, Helen Morrissey, the female CEO of Newton Investment Management, felt that simply putting the company’s name on the women’s shirts was not enough; she wanted to ‘influence the evolution of the event’, and has lent her support to campaigns for more recognition and investment in female rowing. Hopefully 2015 will prove to be a turning point. ‘It means a huge amount to have the boat races coming together on the Tideway’, rowing World Champion Cath Bishop, now chair of the Cambridge University Women’s Boat Club, says. For her, the two crews, their sponsors and supporters, this is about putting the female rowers on ‘the same stage as the men’, and finally bringing parity and equality to the boat race. I think Eglantyne Jebb, Betty Francombe, and the other female rowing pioneers would have been delighted. The Men and Women's Blue Boats weigh-in together on 19 March 2015. The Cambridge mens crew and women's crew topped the scales. The cherry on the cake is that this year the BBC will be covering the women’s boat race live, as part of the same flagship national sporting event as the men’s race, to be broadcast to 200 countries worldwide. Commentator Clare Baldwin has also decided to cover the women's race rather than the Grand National, scheduled for the same day, in the hopes that the equal billing being given to the female crews will have a 'ripple effect all across society, business and sport'. ‘I’m really hopeful that when people see the women rowing across that same course, on the same day, with the same buzz and excitement around them,’ sponsor Helena Morrissey says, ‘it will make people stop and think…’ History is being made on the Thames in two weeks time, and whether you back Oxford or Cambridge, I hope you will support this watershed moment.